RECIFE: Germany's Thomas Mueller scored his fourth World Cup goal to pull level with Lionel Messi and Neymar in a 1-0 win over United States on Thursday that gave his side top spot in Group G.
The United States, coached by former Germany boss Jurgen Klinsmann, also went through to the last 16 despite the defeat in rain-sodden Recife. 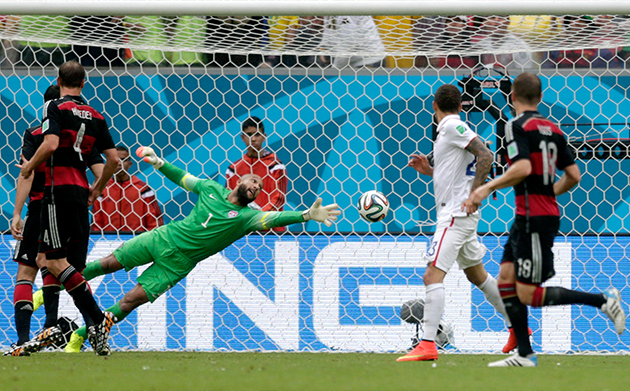 Portugal's 2-1 victory over Ghana was not enough to overtake the Americans in second place. "It's huge getting out of this group," said Klinsmann after the game as he hailed his side's World Cup performance so far. "We knew it would be a tricky game because a tie would have been enough, so it wasn't easy to handle. "But we have a very, very strong team and the players are so hungry to do well. The knockout stage is a completely different ball game," added Klinsmann, whose side will now face Belgium or Algeria. "It's a good feeling, now we get to focus on that one specific opponent in the next game, not on what could happen in the group." The lead-up to this match had focused on suspicions that the Germans and Americans would be happy with a draw that would give both sides an easy path through to the next round. Klinsmann's friendship with his former assistant, the Germany coach Joachim Loew, had reinforced the conspiracy theories. 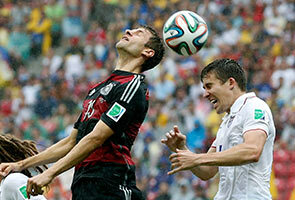 But Germany dominated the match in the washed-out Arena Pernambuco. "We dominated the entire match. We were very well organised and until the last minute we didn't give them much chance to score," said Loew. Asked what he thought about the US's achievement, Loew added: "I'm happy for the US. If you beat Ghana and you draw against Portugal, I think you deserve to get through to the last 16." US goalkeeper Tim Howard repeatedly kept his side in the game for 55 minutes until Mueller broke the deadlock. A well-worked corner saw Howard save from Per Mertesacker's header. The rebound went to Mueller on the edge of the penalty area and he made no mistake with a powerful first-time shot that flew past the goalkeeper. Germany could have had several goals in an entertaining first half in which Howard played the key role. Mueller, playing as a lone striker, came close with a leaping bicycle kick from a cross on the right after just two minutes. Lukas Podolski was given his first start of the tournament and after latching on to Mesut Ozil's ball on eight minutes he whipped in a drive for Mueller, who just failed to connect as Howard dived low to collect. The United States soaked up the early pressure and on a rare foray midfield orchestrator Michael Bradley sent Graham Zusi through on the left for the winger to unleash a drive that sailed just over Manuel Neuer's crossbar. Howard was called into action twice more before half-time, collecting an Ozil snap-shot down low before stopping Podolski's drive across the face of goal aimed at Mueller. At half-time, Podolski made way for Miroslav Klose aiming to for a 16th World Cup goal to pull clear of Brazil legend Ronaldo, with whom he shares the current record of 15. After only six minutes Klose connected with Kroos's flighted ball in towards the back post but produced only a glancing header that sailed wide of Howard's upright. After Mueller's brilliant goal, Germany continued to dominate and US frustrations grew. Left winger Brad Davis was replaced on the hour by Alejandro Bedoya, who was lucky to escape with a warning after fouling Bastian Schweinsteiger. Kyle Beckerman was then cautioned for a foul on Schweinsteiger, who was later replaced by Mario Goetze. US hopes were finally raised on the stroke of full time but Philipp Lahm produced a superb sliding tackle to block Bedoya after a counter down the right. From the resulting corner, Bradley whipped in a cross that saw Neuer tip over from Dempsey's close-range header.